IBF superflyweight champion Jerwin Ancajas is set to step up his training regimen with six weeks left before making his seventh title defense against No. 1 contender Ryuichi Funai of Japan at the 12,000-seat Stockton Arena in California on May 4 and has relocated his camp to the Marine base in Ternate, Cavite. Trainer Joven Jimenez said he’s isolating Ancajas from distractions and keeping him focused with an army of five sparmates. Ancajas hasn’t sparred more than eight rounds since opening camp over a month ago but will slowly work to 10 then 12 rounds as the fight draws closer. Jimenez said it’s all part of a schedule to put Ancajas in peak form on fight night without burning out and dehydrating. Aro said the key is to make sure Ancajas is properly nourished while going through the stages of preparation. “We’re aiming for Jerwin to go down to 120 pounds 10 days before the fight,” she said. Cutting back five pounds in 10 days to make weight shouldn’t be difficult. Ancajas, meanwhile, has been sharp in sparring, showing the quickness, volume-punching and power that marked his knockout wins over challengers Jose Alfredo Rodriguez, Teiru Kinoshita, Jamie Conlan and Israel Gonzalez. He wasn’t impressive in outpointing countryman Jonas Sultan in his fifth defense and looked out of synch in salvaging a split draw with Mexico’s Alejandro Santiago in his sixth defense last September. But Ancajas is determined to bounce back with a bang particularly as the large Filipino community in Stockton is expected to pack the arena, hoping to celebrate a sensational victory. Stockton, an 80-mile drive from San Francisco, drew a flock of Filipino migrants in the 1930s and promoters used to bring in Filipino boxers to cater to the growing community in the pre-World War II era. Small Montana, Speedy Dado, Little Dado and Ceferino Garcia were among the Filipino champions who performed in Stockton during that period. Maxie Docusen, Rosalio Caballero, Danny Kid, Fel Clemente and Rod Sequenan were others who fought in Stockton through the years. Ancajas’ fight against Funai will be the chief aperitif to the main event featuring IBF lightheavyweight titlist Artur Beterbiev of Russia against challenger Radivoje Kalajdzic of Bosnia-Herzegovina. Beterviev, 34, is a former AIBA world champion and has a pro record of 13-0, with 13 KOs. Kalajdzic, 27, totes a record of 24-1, with 17 KOs. His only loss was to Marcus Browne on a disputed split decision. Top Rank is producing the show which will be televised live on ESPN and ESPN Deportes. Tickets are priced at $175, $100, $65, $40 and $25. “Top Rank is really excited to bring big-time boxing to Stockton,” said Top Rank chairman Bob Arum. “We welcome Jerwin back to the US in a great fight against Funai.” Ancajas’ last three fights were in the US, moving from Corpus Christi to Fresno to Oakland. 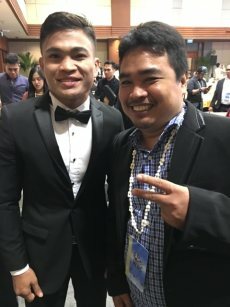 Jimenez said Ancajas may jump to the bantamweight division after battling Funai. But at the moment, his focus is retaining the IBF crown, nothing else. Ancajas’ decision on his future will depend on how he performs against Funai who has won his last seven outings, 14 of his last 15 since 2012.